In a generation where it pays to stand out, it has become more and more difficult to do so in the event and exhibition industries. Budget so often dictates design that many brands have become dependent on stock, off-the-shelf, display products. While many times this is a necessity due to budget, it also pigeonholes the brand into a corner of mediocrity. With the shift that has taken place in the way consumers / audiences now expect to be marketed to, the influence of the stock environment does not stand out. For a brand to be noticed, it must capture the audience in a unique and unexpected way. That is where Fabric Images’ FreeStyle Rental program comes in. The FreeStyle Rental program was developed to allow designers to design and brands to differentiate themselves. The premise of the program? Any material; Any metal; Any design. Combined, the result is a truly unique experience that speaks to the brand persona while capturing the attention of the audience. That is an obvious benefit for any brand, but the most notable facet is that although custom, the FreeStyle Rental program saves up to 40% on cost compared to purchase. Brands are taking advantage of this cost-effective method of custom, self-expression based, rental. It is allowing for a higher quality of connection with the audience and is setting a precedent for the brand. Individualized environments are critical in representing a brand and creating connection points with the audience. Stock shapes? I think not! Designed by Jack Morton for National Geographic Kids and cottonfrombluetogreen.org, for an event celebrating the “Most Items of Clothing Collected for Recycling”, this very custom display was rented under the FreeStyle Rental program. There is nothing ordinary about this publically displayed architecture. 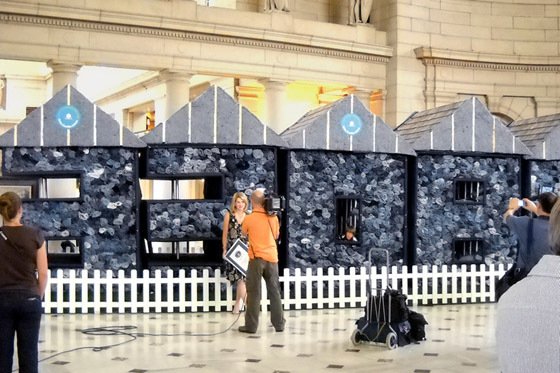 The framework was custom-created to form the numerals “33080”, which is the number of jeans collected for recycling. More distinctive yet was the denim fabric used to cover the structure. It truly spoke to the brand and the message. Would a cluster of stock shapes with spandex covers have had the same effect? Probably not. Imagine this conference room with only a flat white projection screen in the background. Now, stop imaging because it may put you to sleep. 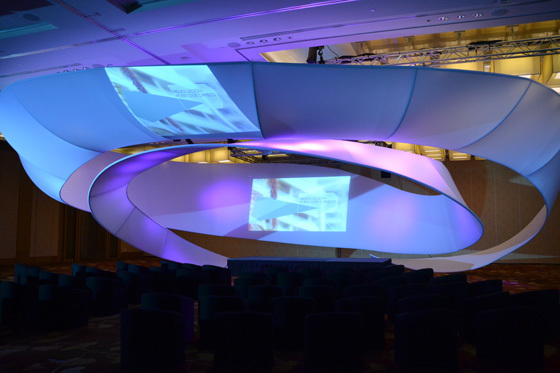 This three-level spiral, designed by AHA Universo, brought this corporate conference environment to life. Without it, the otherwise drab room would have been lifeless. 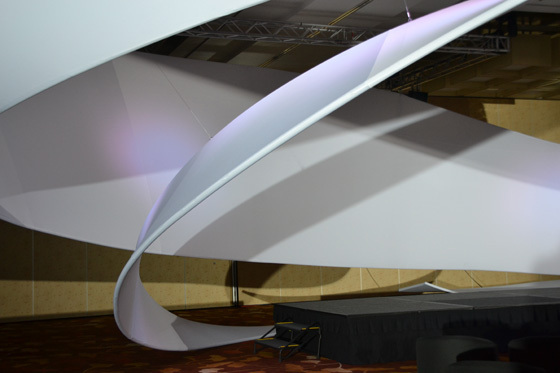 The custom bent framework with white fabric covering came to life with color-changing lights and also acted as a projection surface for the presenters’ presentations.